Employers continued their steady hiring in July, which marked the 58th consecutive month of job gains. 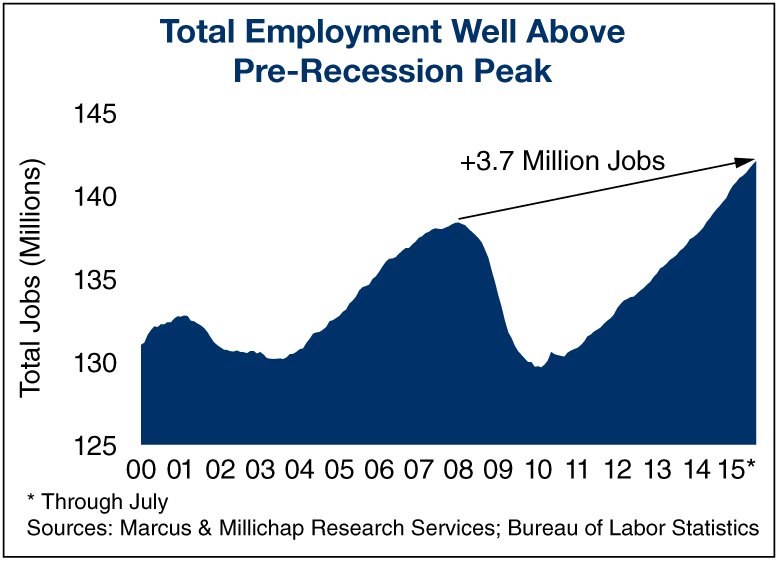 Cumulatively, the U.S. has added 12.4 million jobs since the recovery began, and total employment stands 3.7 million positions above the pre-recession employment peak. Despite month-to-month volatility, the trends have been remarkably sturdy, generating average monthly additions exceeding 200,000 jobs. This consistent performance offers the Fed a solid foundation to begin modestly raising rates later this year, despite some soft readings in measures such as wage growth. U.S. employers added 215,000 positions across a broad array of private-sector industries in July, including retail companies. Trade employment added 60,000 workers, predominantly at shopping malls and stores. Despite a strong U.S. dollar that limits exports, manufacturers rallied from a lackluster first half of the year to create 15,000 posts last month. Auto sales were also strong in July, and the ongoing replacement of older vehicles by consumers will sustain payrolls at vehicle and parts factories in the coming months. Oil and gas activities, however, remain a drag on the labor market. A fall in oil prices to less than $50 per barrel in July contributed to the loss of 4,000 jobs in natural resources and mining, the only private employment sector to trim payrolls last month. Average hourly earnings rose 0.2 percent last month following a flat reading in June, culminating in a modest 2.1 percent advance from one year ago. Conditions supporting more substantial increases continue to align, however. The number of workers quitting jobs, presumably to take higher-paying positions, is near a post-recession high. Additionally, the unemployment rate of individuals in their prime earnings years, ages 35 to 54, has compressed to around 4 percent. The thinning pool of experienced workers will place additional pressure on wage trends. Non-store retailers, including Amazon, comprise a modest portion of total retail employment but remain a potent growth engine; they have expanded 4.7 percent year to date, or by 24,000 workers. A reduced reliance on physical retail outlets is expanding requirements for fulfillment centers and contributing to growth in the industrial property sector. Nationwide, tenants moved into an additional 54.4 million square feet of industrial space in the second quarter to shave vacancy 10 basis points to 6.9 percent, the lowest level in 14 years. Additional demand growth and a modest expansion of stock will further reduce vacancy this year and underpin average rent growth of 5.3 percent. Rental housing continues to benefit from the employment gains as well, while the subdued pace of wage growth has suppressed the migration to homeownership. In the second quarter, the homeownership rate fell to 63.4 percent, its lowest level since 1967. Reflecting this trend in preference for rental housing, the U.S. apartment vacancy rate tumbled 40 basis points in the second quarter to 4.1 percent, its lowest level since 2006. Expected job gains through the remainder of the year combined with positive demographic trends should support continued absorption and elevated rent growth through the fourth quarter. This entry was written by marcusmillichap, posted on August 11, 2015 at 11:03 pm, filed under Uncategorized. Bookmark the permalink. Follow any comments here with the RSS feed for this post. Post a comment or leave a trackback: Trackback URL.